What’s for lunch today? Our family seldom eats rice for lunch, sometimes clears away the leftovers in fridge. Very often, I like to have fried noodles. 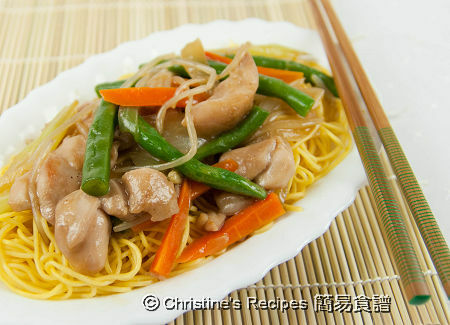 Previously I shared the classic Cantonese fried noodles with pork (肉絲炒麵). 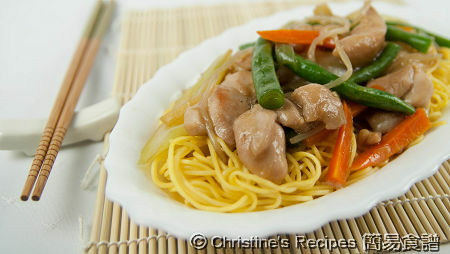 Here I post another one of my favourite fried noodles, it’s fried with chicken together with lots of vegetables. As a matter of fact, whatever kind of fried noodles dish is placed in front of me, I won’t hesitate to taste and will definitely eat a lot, even though it’s just fried with veggies. So I’ve got a nickname, “Noodle Queen” in my family, haha..
Blanch noodles in boiling water to wash away the starch and to loosen them up, about 3 minutes, according to the instructions of the packet. Rinse with plenty of water. Drain well. Cut chicken into bite-size pieces. Mix with marinade for 20 minutes. Sauté with hot oil in a wok or frypan over medium-high heat, until cooked through. Set aside. Add some oil and cook onion until translucent. Add green beans, celery, red carrot and cook until softened. Lastly, add bean sprouts. Pour in seasoning and bring it to a boil. Meanwhile, use another wok or frypan to stir fry noodles. Add 2 tablespoons of oil, sauté ginger and spring onion until aromatic. 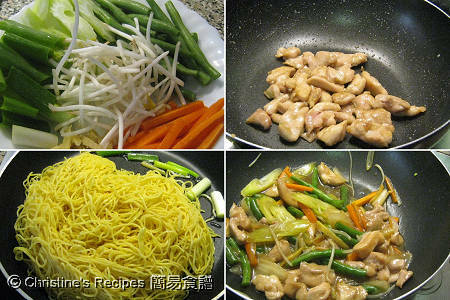 Add noodles, turn heat to high and stir fry until noodles are lightly brown and crisp. Season with salt along the way of frying noodles. Remember to taste by yourself. When the noodles are hot enough and you’re satisfied with the taste, it’s done. Transfer to a platter. When the seasoning boils, add thickening, and cook to your preferred consistency. Pour over noodles. I usually do it this way for getting better presentation and the dish appeals my family’s eyes. Yet, you can use another way as many people do. Return the noodles and stir fry with seasoning. Stir and mix all ingredients together. Either way will do. Serve hot. The presentation, the photos, the clarity of the recipes all are you. Very professional and appealing. Thank you for sharing. Wish I could eat the pictures. Perfect! Forget lunch - this is my dinner! Love the photos - making me hungry and I just ate! I love yours! Stir fry noodle is such a easy thing to make. I usually have it at least once a week. Your noodle appeal to my eyes as well, I love the presentation and the pictures look appetizing. Christine, what a lovely name you have earned for yourself...Noodle Queen! I should be named 'Rice Queen' then cos I can't live a day without rice! I love noodles too and this dish looks very delicious to me. Beautiful presentation. Hey Ms Noodle Queen! I can see why they've given you this nickname - your picture looks so tasty! Thanks for sharing the recipe! What a dish! Such a nice touch of this noodle. Must be super delicious lol! Noodle queen - this yummy looking dish has my name on it - looks like its just about perfect. I wish you all the best and hope all your dreams come true! Simple and tasty! Perfect lunch dish!